The prototype I current have (the one in all the pictures) actually does have removeable standoffs so it is possible with the current frame design but I'm not happy with how it turned out. It requires custom-machined standoffs (extra expense) and extra-short screws (more difficult to source) but the resulting thread depth is so shallow that the motherboard screws have very little engagement. Thus I made the decision to switch to fixed standoffs for the production design even though it doesn't technically meet the microATX specification. And then the ATX variant was done as an afterthought since it reuses most of the parts so it inherits the same fixed standoffs. That diagram about the standoffs cleared up a lot of confusion for me. Thanks Phuncz. So, in theory. I could nab some plastic standoffs (easier to sand down) and some epoxy glue and mount an MATX board? I'd just turn the case on its side and let the weight of the board hold the standoffs in place while the epoxy cures and voila. Or is this a dream of a madman? Could the other standoffs (for ATX boards) be left alone after this and I have easy peasy extra height for a radiator? Qrash and Phuncz like this. But yes, that should work. You could also use them to secure a custom shroud or some extra PCB like a better fan controller even ! Ohh boy, I have a feeling my entire tax return is going to be "wasted"
I'm excited for the X as it will let me madke my ideal itx buld: Front SFX psu + 120mm front rad + 240mm bot rad AND room for a horizontal pump+res combo underneath the gpu / above the bottom res. VegetableStu, 3lfk1ng and Phuncz like this. Soul_Est and WadeAK78 like this. Hopefully there will be more microATX boards. The selection with the current-gen parts is somewhat lacking. And any more takers on the pre-pre-production units? I thought that after Nvidia dropped 3 and 4 way SLI we'd see more mATX development. But it would seem that we've been caught up in the CrossFire. Yeah, we'll have to wait and see what the mobo companies show at CES but I'm worried they'll abandon the enthusiast microATX market. 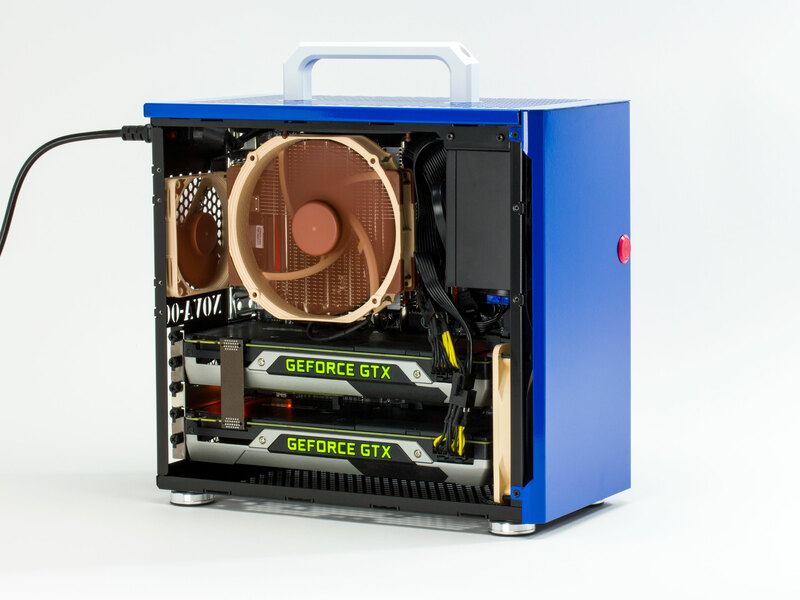 I found you through searching for a mATX case and initially stumbled upon the Nova concept, but sadly not until after the Cerberus Kickstarter had already concluded. I was excited to find out there are still plans to manufacture Cerberus and have been catching up through the forum. I guess as a general question, what can one expect from a pre-pre-production unit? should ship mid-January if the schedule doesn't slip. Out of curiosity, would anyone be interested in buying the original Nova prototype? Little ol' Blue needs a home? Yeah, I'm seriously considering spending a month or two in Japan and then going from there to Taiwan for Computex. I've realized that I'd rather have the experience of going to another country for a good chunk of time than holding onto this case forever. So despite my attachment to it as my first serious design made real, I'd rather sell it to someone who'd make use of it to help fund my trip. Ceros_X, iFreilicht, VegetableStu and 3 others like this. It's a bit scuffed up and scratched, top panel is a total pain to remove, and several other little issues, but I paid $2600 for it so I'm thinking $400. Are there any major compatibility differences between Blue and the production MATX models?